Flamingos might be one of the most extraordinary birds in the world, but did you know they’re also hot property when it comes to home decor and entertaining trends? You only need to scroll through Pinterest or Instagram to see style-savvy bloggers sporting everything from flamingo inspired pool floats to donuts decorated just like the hot pink animal. That’s why we’ve decided to round-up 40 of the most fun and flamboyant flamingo inspired projects. Whether you’re after accessories, party games, home decor, or edible delights – we’ve got it all for you below! Are you ready to flaminglo with these DIY possibilities? Let’s get started! Flamingo inspired crafts might seem like a summer décor idea, but A Kailo Chic Life will show you how to turn them into Christmas ornaments to adorn your tree with this festive season! Everyone seems obsessed with flamingo pool floats these days (and for a good reason too), but how about creating your own edible donut versions of the trend? Aww Sam is an absolute genius! Flamingos can also serve as the perfect Halloween lawn accessories, just as Aww Sam proves with this incredible tutorial for DIY flamingo lawn pumpkins! Now you can have your cake and eat it too, thanks to this tutorial from Aww Sam teaching you how to make a DIY flamingo pool float cake! Does it get any better than this? It just wouldn’t be a flamingo themed party without flamingo balloons, would it? Find out how to create your own over at Balloon Time! 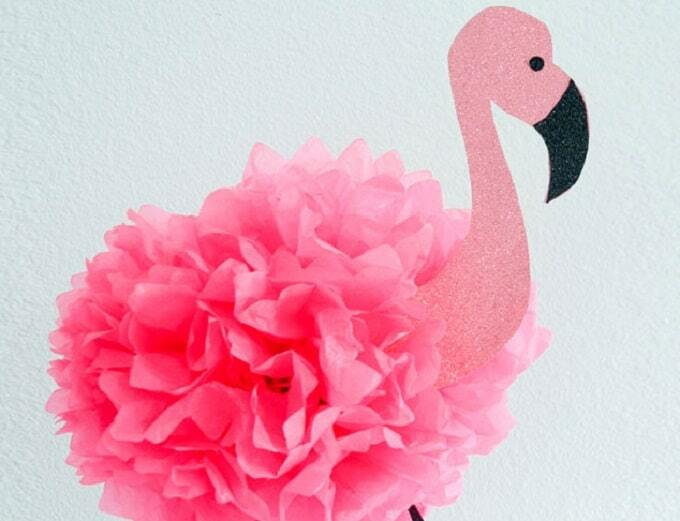 How pretty is this DIY flamingo piñata from Best Friends for Frosting? This would be a wonderful addition to any kids’ birthday party! Here’s one for all of you cake lovers! Bird’s Party will show you how to make your very own flamingo inspired drip cake, complete with flamingo toppers. Brilliant! Trust the clever gang at Brit + Co to come up with this idea – a DIY flamingo-shaped marquee light! Fancy decorating your space with one of these? Adults can have fun getting dressed up on Halloween too, just as Dani Lauren has done! She’ll show you how to create your own DIY flamingo costume in her YouTube tutorial. Here’s a clever Mother’s Day card that children will love making. Design for Soul created this DIY flamingo version featuring pom poms – too cute! Add some flamingos to your drinks thanks to these DIY printable flamingo straw toppers from Design is Yay. This craft project is so easy! Speaking of straw toppers, here’s some more DIY versions from Fete Gazette. These ones are oh-so-stylish! You can also create some really fun DIY flamingo inspired party décor using a paper pom pom, just as Frog Prince Paperie has done. Where will you display yours? Here’s a DIY garland from Giggles Galore featuring both flamingos and pineapples – the quintessential summer party symbols! We adore this idea. Glorious Treats is so talented – she created these cookies by hand! The good news is that she’ll also show you how to recreate the treats through her step-by-step tutorial. Forget your traditional winter landscape snow globes – Gray Malin has actually created a summery flamingo version which we love! You won’t want to miss this DIY tutorial. Here’s a DIY flamingo idea that will light up your life! Handmade Charlotte created a flamingo-filled chandelier to add a pop of color to her space…incredible! Handmade Charlotte has created a DIY marionette featuring a flamingo! This would make a great hand-crafted gift for a loved one. Here’s a flamingo finger puppet that will entertain the kids for hours! You’ll have to check out the full tutorial from I Heart Crafty Things to make your own. Wow, we love this flamingo inspired wrapping idea from Kittenhood! You too can achieve this crafty look with pom poms and pipe cleaner. Made with Happy has created these DIY flamingo patterned sneakers – Ooh la la! This is a surprisingly easy project that you can knock-over this weekend. This flamingo treat bag from Oh Happy Day will liven up any party! Imagine all of the treats you can fill this with. Here’s a DIY flamingo Halloween costume which won’t frighten the children! Oleander and Palm will show you how it’s done. A flamingo inspired wreath? Why not! This can serve as a non-traditional wreath for the holidays, or something on-display all year around! Thanks Oriental Trading for this clever idea. This flamingo inspired headband could serve as the perfect accessory this New Year’s Eve – don’t you think? Shoes Off Please is the clever crafter behind this tutorial. Here’s another flamingo piñata to bring some life to the party! Studio DIY is certainly a flamingo fan. Here’s a Christmas inspired flamingo project, just in time for the festive season! Studio DIY created this lawn flamingo sleigh to add a touch of quirkiness to the silly season. Here’s an egg-cellent flamingo inspired DIY which you’ll want to make for Easter. Studio DIY turned her eggs into a flamingo and a swan – so pretty! 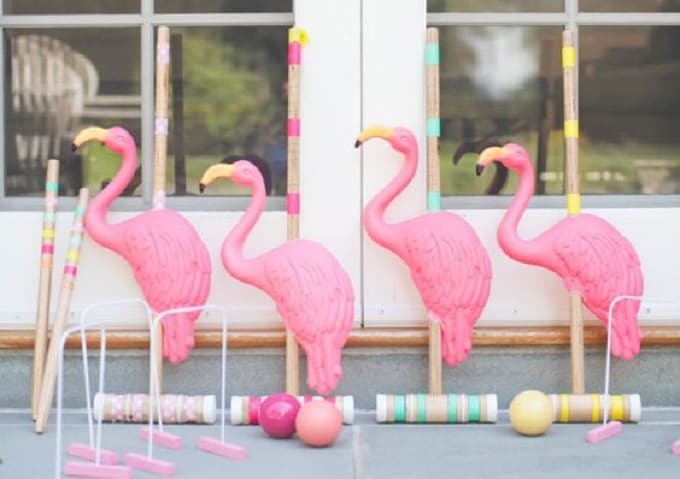 If you’re a fan of Alice in Wonderland (or simply love flamingos), then these DIY flamingo croquet mallets will be right up your alley! Style Me Pretty will teach you everything you need to know to recreate your own. Flamingo lawn toss seems like a fun game that both children and adults alike can partake in. This makes it the perfect holiday activity, so be sure to check out this DIY tutorial from Sugar and Cloth! Speaking of Sugar and Cloth, how wonderful are these DIY flamingo macarons from the talented blogger? They almost look too good to eat! Add some flamingo style to your bedroom with this DIY pillow design inspired by the pink bird. Sugar and Cloth has a great, step-by-step guide for you! Thinking of hosting a flamingo inspired party any time soon? Be sure to print out these flamingo cone wraps from Sweet Enchanted to adorn the ice creams! Marshmallows that look like flamingos? Count us in! This tasty treat can be made by following the instructions from The Decorated Cookie. We have a penchant for ring dishes, so imagine our delight at finding this DIY clay flamingo ring dish from The Glitter in My Tea! Bravo! Here’s another way that you can incorporate a flamingo into your Halloween décor – Spray it in candy corn colors, just as The Glitter in My Tea has done! This DIY felt flamingo garland is perfect for parties or simply to decorate any space within your home. We love this idea from The Crafty Mummy Blog! How adorable are these DIY flamingo pull toys from This Little Street? The only thing that could match its cuteness is to see a tiny tot having fun with it! Wild Birds Collective will show you how to make your very own flamingo shaped pillow – isn’t that wonderful? We can’t wait to make one for our own space! This quirky DIY craft tutorial for lawn flamingo taxidermy is from World Market – don’t these look great? This is one way to add color and intrigue to your walls! There you have it – 40 DIY flamingo inspired projects to make you stand out from the flock! Which projects were your favorites? We’d love to hear from you in the comments section below!